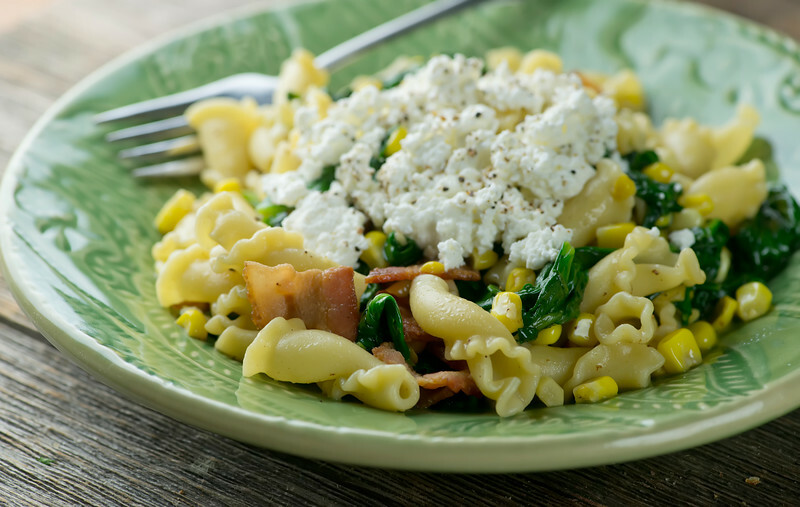 This easy recipe for summer corn and bacon pasta captures all the fresh flavors of the season in one quick supper. With a little ricotta cheese on top! Before I get into the deliciousness that is this recipe for summer corn and bacon pasta, can I ask if anyone else gets all emotional at their local farm market? Because I do. I look at the piles of local tomatoes and blueberries and corn and have to hold myself back from piling unreasonable amounts of them into my shopping basket, because I just know that in a heartbeat it is going to be fall and we will be surrounded by pumpkins and all the corn will be GONE. And so I am making very sure that I am cooking suppers full of tomatoes and corn as many times a week as I can fit them in. This recipe also includes spinach and ricotta cheese, and my favorite always-in-season ingredient, bacon. Ready for some summertime deliciousness? Let’s make it!The other scrumptious thing about this recipe is that it takes almost no time in the kitchen. 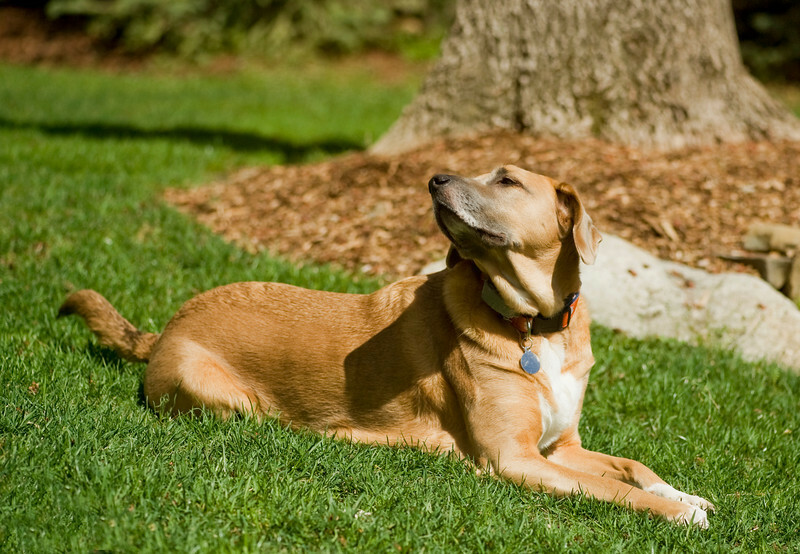 More time for lounging around in the summer sunshine. You need a nice short pasta – I like campanelle, but penne or ziti or even bow-ties will work just fine. You also need some nice ricotta – and here is my regular pitch for you to make your own, which takes 10 minutes and three ingredients and is SO easy, so click here for that one. Some spinach, some fresh corn and of course, BACON, and you are ready to go. While the pasta is cooking, saute some chopped bacon until it is nice and crispy and then scoop it out. Drop the spinach right into the same skillet and cook it up until it is nice and wilted. Save a little of the pasta water before you drain it, and then add the pasta to the skillet with the spinach. Stir in some fresh corn kernels – they don’t actually have to cook because they are going to taste perfect right off the cob – we just want to get ’em a little warm. Add a little butter and some pasta water and toss everything around until you have a light sauce and all your ingredients are nice and mixed up. Add the bacon and toss again. Taste it (my favorite part!) and add a little sea salt if it needs it. Now this is perfectly wonderful just as it is, but I like to send it over the top by adding a dollop of ricotta and a generous grinding of pepper. And there you have it – so many good tastes all on one plate. Summer deliciousness! Cook pasta according to directions. Scoop out a cup of pasta water before you drain it. While the pasta is cooking, saute bacon in a large deep skillet until crispy. Remove and set aside, leaving drippings in the skillet. Add the spinach to the skillet and cook over medium heat until wilted. Add pasta and corn and saute until warmed through. Add butter and just enough pasta water to make a light sauce and toss again. Stir in bacon, and season to taste with salt and pepper. Divide among plates and top with ricotta and more pepper if you like. Enjoy! I am already emotional thinking about Fall, Kate. While I can’t wait for the weather that accompanies Autumn… I am going to miss Summer produce like no body’s business! So YES to eating seasonally at every meal right now! Love this pasta! I have one kinda similar coming in a few weeks, but it’s also pretty different! I am LOOOOVING yours! Corn and bacon rock the house, but add some spinach and ricotta and oh boy, I’m in heaven! This looks just perfect, dear friend! Cheers to you and a wonderful weekend! P.S. I love your pup!!! The poor farmers probably don’t know what to do with you! Just buy a little (or a lot) of everything and then get busy cooking! :) I love what you’ve done with the corn in this pasta! Great way to use the best of the produce! I’m new to your blog and it fits right in with how I’m cooking these days. I’m going to make ricotta this weekend along with this pasta dish. I get all emotional over farmer’s markets too! But, seriously, where does the time go?? It’s soon Fall! Love your suggestion of putting a dollop of ricotta cheese on here! Good stuff! Your fur baby is so cute! !